Looking for something to hand out at your ceremony for guests to throw in celebration? The Canvas Heart Confetti Favors are perfect. 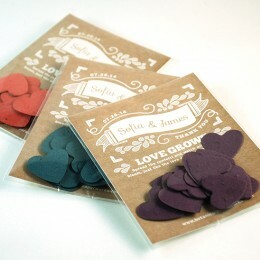 The large heart shaped confetti flutters in the air when it is thrown making for gorgeous photo-ops. 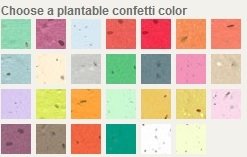 Choose from 27 color options to perfectly coordinate with your special day. And don't worry about the clean up, seed paper confetti is 100% biodegradable and will compost into the ground leaving gorgeous wildflowers.